Last Saturday I went to our weekly outdoor market to find some shellfish. Specifically, I wanted some lavagnons and coques (cockles) to make linguini with white clam sauce. We're lucky to have a fish monger who comes in every week from the coast near the Marennes-Oléron area, about 300 kilometers (185 miles) west of Saint-Aignan. Lavagnons (flat, gray shells) and cockles (ridged, beige shells) steaming in white wine. 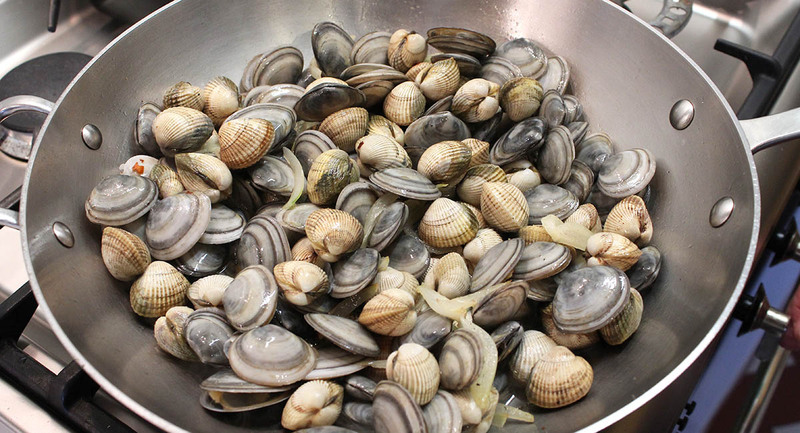 The lavagnons are a local clam, very delicate in texture and flavor, and the coques are a little bigger and meatier. I thought that mixing them would be good for this dish, and it was. First, though, the mollusks had to be purged. Ken mixed up some water with sea salt and added about a tablespoon of semolina (cornmeal works as well). The shellfish sit in the water and begin filtering; any sand in their digestive systems is ejected while they ingest the semolina or cornmeal. After an hour or two, they're ready to cook. The finished dish -- a nice change from the Christmas turkey. Dig in! We steamed the shellfish in white wine with onion and garlic and some red pepper flakes. 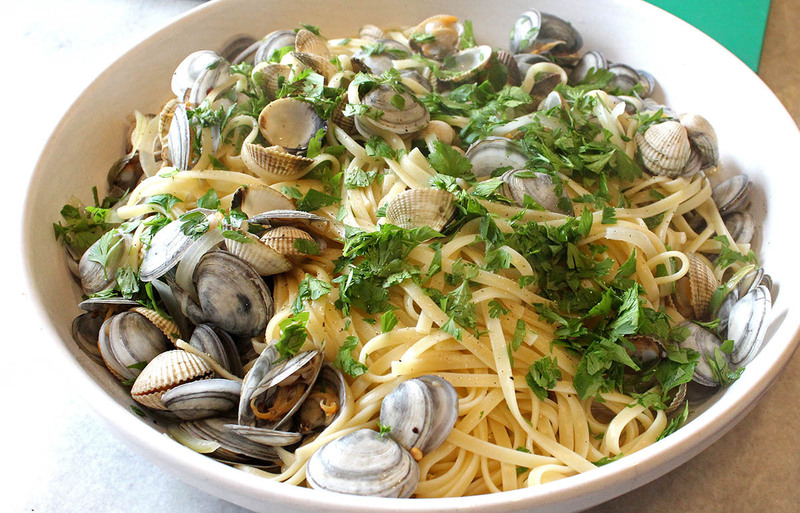 Once the shells had opened, we added cooked linguini and finished the dish off with chopped fresh parsley. What a feast! This is the wine we had with Christmas dinner. It's an Irancy from Burgundy, one we brought back from our trip there last October. After tasting the first bottle right after our trip, we realized that it's a wine that needs to be decanted, so that's what I did just before I took this picture. I decanted the wine into a bottle we found in Sonoma, California, a hundred years ago. 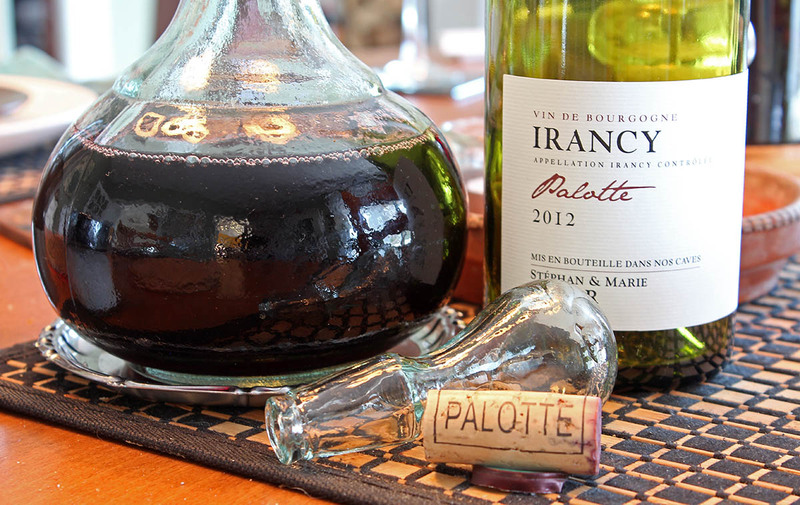 Irancy is made from pinot noir grapes in northern Burgundy. This particular bottle was made with grapes from the "Palotte" vineyard, a small parcel in the hills above the town. 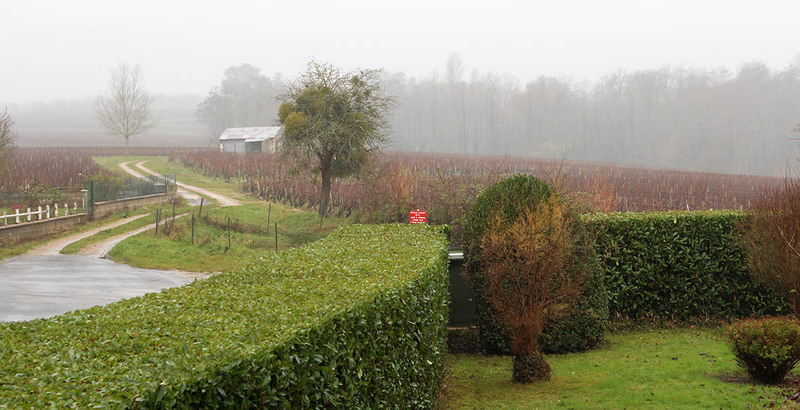 From what we've been told and have read, it's one of the more prized parcels of grapes in Irancy. We had no idea* when we bought it, of course. The wine tastes good, so it must be so. *The guy at the tasting room did say something about it, but my mind processed that as a sales job. Ken did some online reading later on that confirmed his comments. 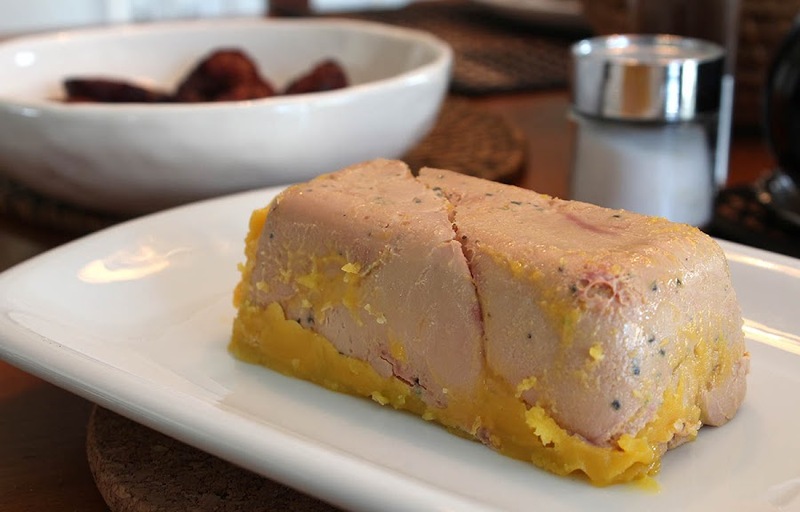 One of the incontournable (must-have) food items during the end-of-year holiday season is foie gras (fattened goose or duck liver), so when we saw that our local volailler (poultry vendor) had some available, we couldn't resist. What they had was whole duck liver, prepared and cooked, in containers of either 250 grams or 500 grams. We opted for the smaller one. Six perfectly ripe figs, ready to go. During the holiday season, the supermarkets are chock full of canned and vacuum-packed foie gras in all its iterations ranging from whole livers to agglomerated liver pieces to pâtés made with foie gras (and other things). We've had many of them over the years, and they are normally good. Our local poultry vendor had obviously prepared and vacuum-sealed their own duck livers and we wanted to give them a try. 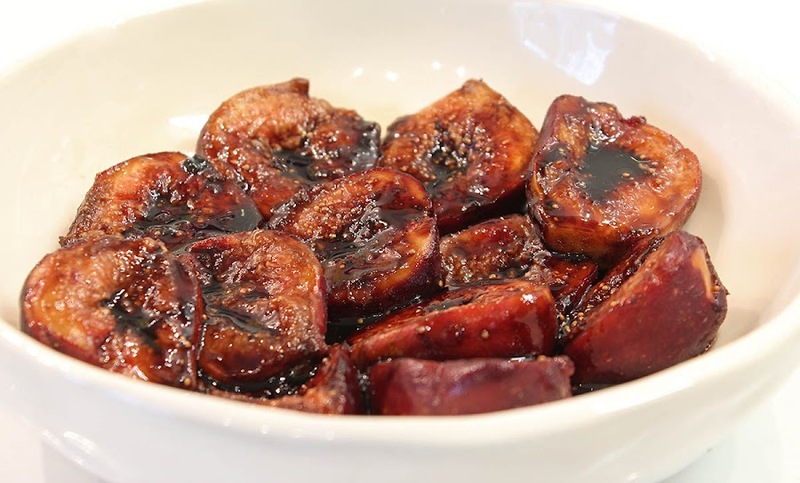 Figs halved and cooked slightly in a reduction of balsamic vinegar and sugar. The foie gras is good on its own, but it also goes really well with a sweet accompaniment, most often a type of chutney made with figs. 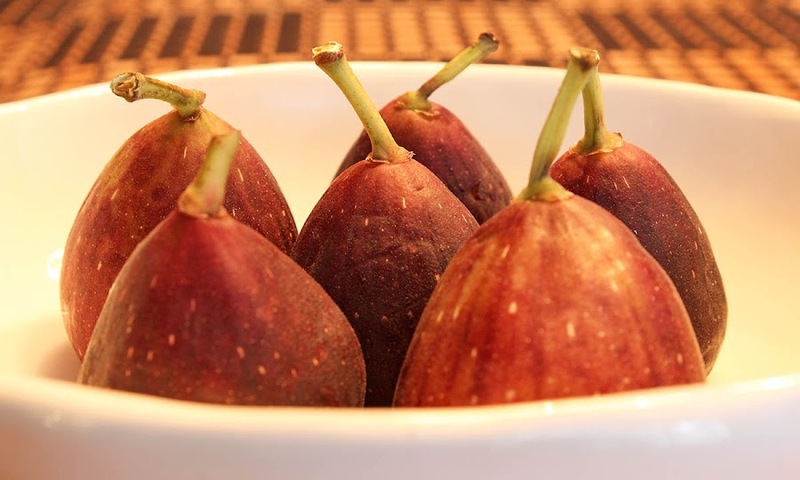 We found some nice figs in a grocery store and planned to have the liver and figs as our first course on Christmas day. I made a reduction of balsamic vinegar and sugar (which turns into a thick, sweet syrup) to dress the figs, each cut in half. The foie gras is ready to be sliced and served with figs along side. The result was delicious! The duck liver we got has served the two of us twice, so far, and there is enough for four more servings. 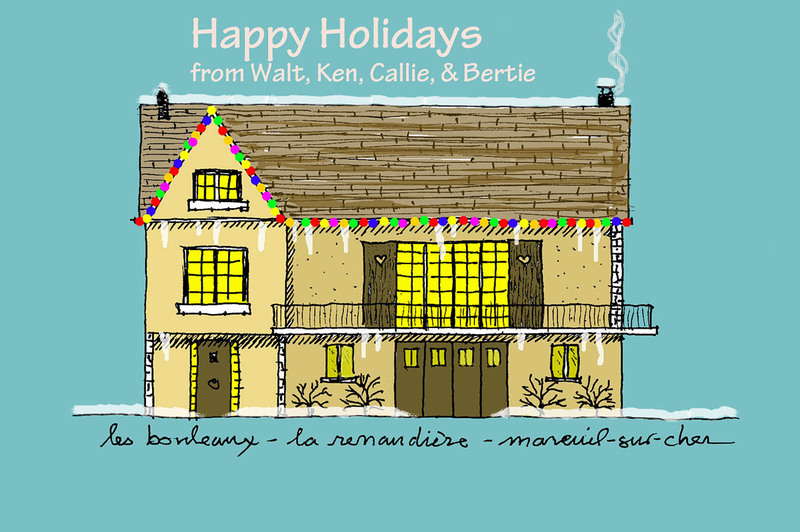 It's a nice little luxury for the holidays. 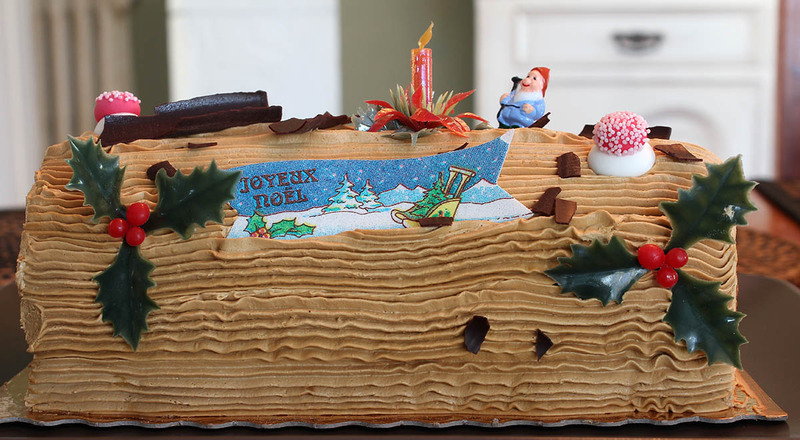 I know that Ken already posted a photo of our Christmas cake, the traditional French yule log. But I took some pictures, too, so here they are. This year we ordered our bûche from the local baker, who advertised that he would be taking orders. Ours was a coffee flavored butter cream cake for four people. Turns out, it would have easily served eight. 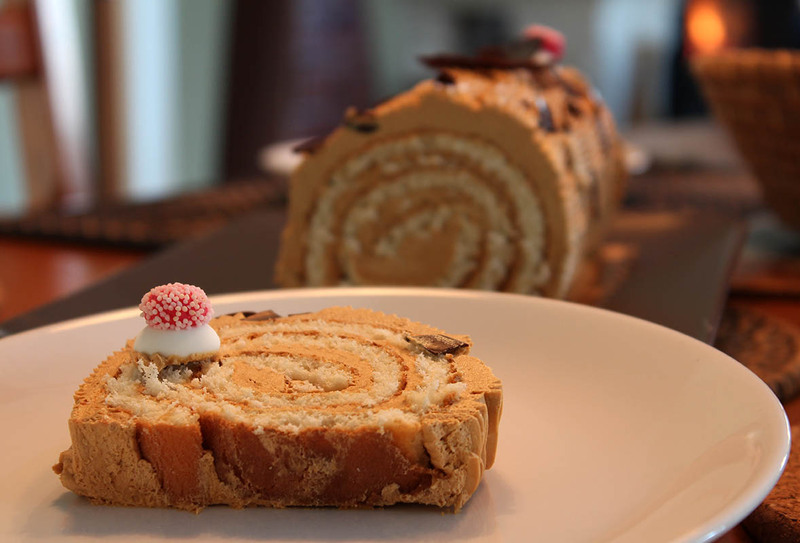 A slice of the yule log, with a sugar candy mushroom on top. Just before Christmas, we watched a program on television about the traditional bûche de noël and how they are mostly industrially made these days. Even the ones in pastry shops are either frozen then thawed, or made from kits supplied by factories. We feared the worst. The whole cake, before we cut into it. But, as it turns out, it seemed to us that this one was indeed made by our baker. At least, that's what we choose to believe. The cake tasted and looked home-made, as did the frosting. And the decorations didn't seem commercial enough. And, in the end, it tasted delicious. So, if we were fooled, so be it. 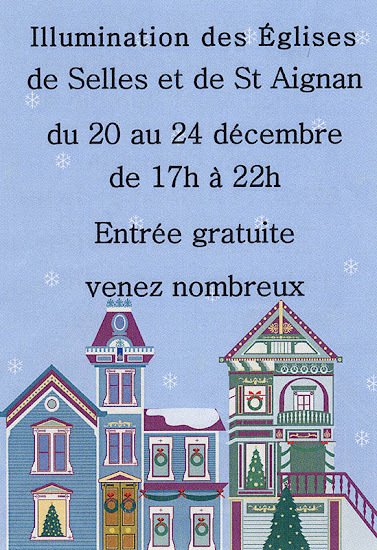 Christmas is done, but the holiday week continues with la réveillon de la Saint-Sylvestre (New Year's Eve) coming up on Wednesday. And television continues to offer up cheesy holiday specials. This week's cover guys are Cyril Hanouna and Nagui, both hosts of popular early-evening programming. In fact, they are the two most popular early-evening hosts in the country for 2014. I didn't even know that was a category. A double interview with two popular hosts. 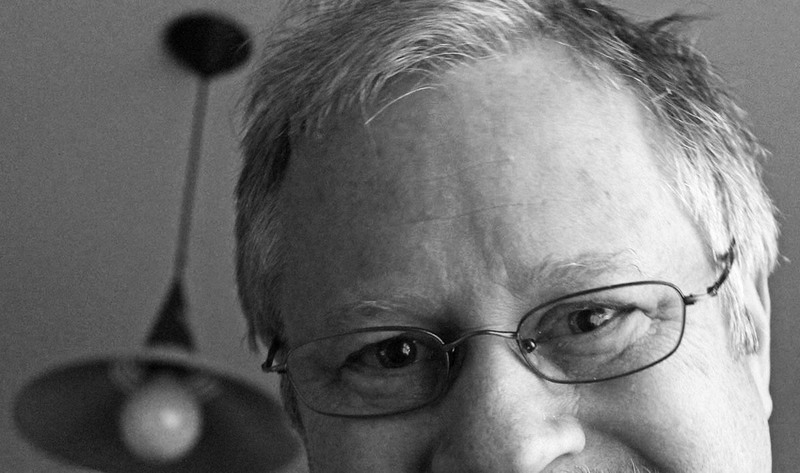 Nagui has been on radio and tv since the early 1980s. Nagui's show is called N'oubliez pas les paroles (Don't forget the words). It's a game show where contestants have to come up with the next line of a popular song; I've seen it once or twice. I've never seen Hanouna's show which is called Touche pas à mon poste ! (Don't touch that dial!). Apparently it's a tv show about what's on television. The other night we watched "Titanic" again. I hadn't seen that one in a bunch of years. It was fun to watch, but I'm sure it will be many more years before I see it again. My heart will go on. We enjoyed our traditional cheese fondue on Christmas Eve as we do every year. This year I got three types of cheese: comté, beaufort (two French cheeses), and emmental (from Switzerland). We used a total of 500 grams. I grated the cheeses, then Ken stirred them into about a cup of white wine that had been brought to the boil with a garlic clove. Once the cheese melted, he added a shot of kirsch (cherry brandy) and a pinch of nutmeg. This newer electric fondue pot has recently replaced our old 1970s style pot. It's funny that you can't see the cord, but it's there somewhere. 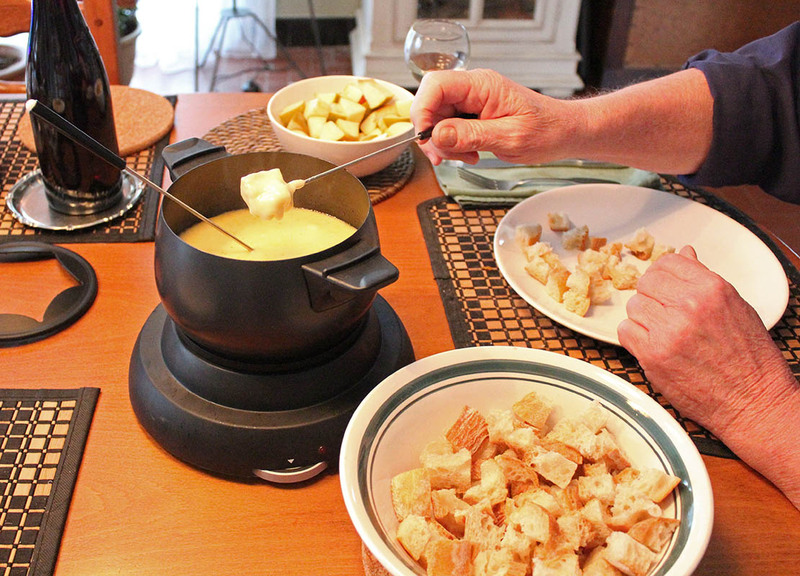 We served the fondue with cubed bread and apples then followed up with a green salad in a garlicky vinaigrette. Tasty! It's not Christmas, and stop calling me Eve. We got this flyer under the windshield wipers last Saturday at the market. The local churches have light shows in the days leading up to Christmas. We probably won't go. The strange thing is the Victorian style architecture in the graphic. That is not at all French. 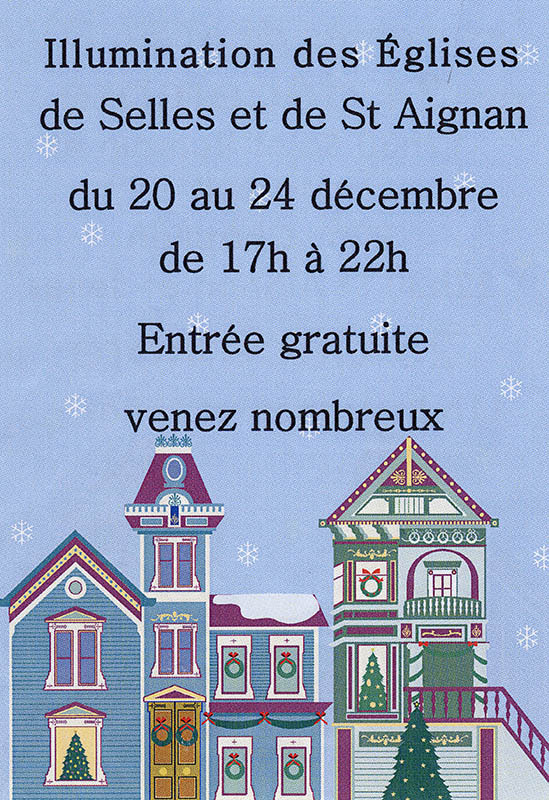 As far as I can tell, "venez nombreux" can be translated as "come one, come all." The other side of the flyer announced the times for "midnight" mass, which is in quotes since, according to the flyer, it happens at 17h30, 20h00, or 22h30, depending on which church you go to. Not at midnight. Again, we won't be attending. Catholics, we are not. 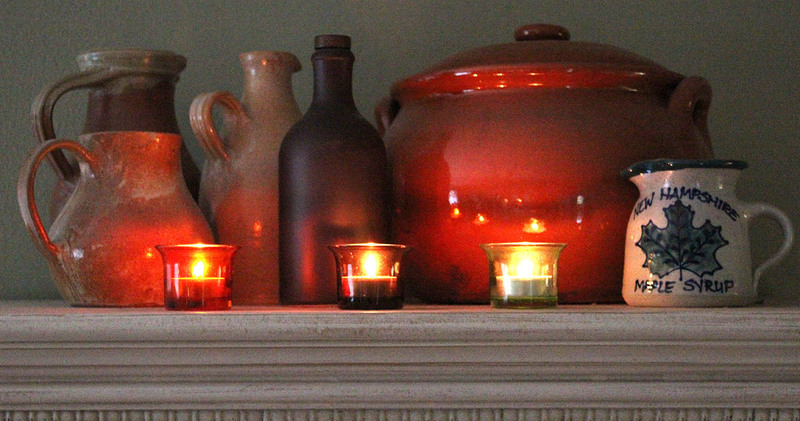 There's no reason for this photo other than I thought it looked pretty the other evening with the candles lit. These pitchers and bean pot sit up on top of the vitrine (china cabinet) in our dining room. Our shopping trip on Monday was successful and not stressful. We got all the last minute food items for the next few days and won't have to go out again until Saturday. I want to go to our local market for some shellfish then. That will make a nice change from what we will be eating all week. 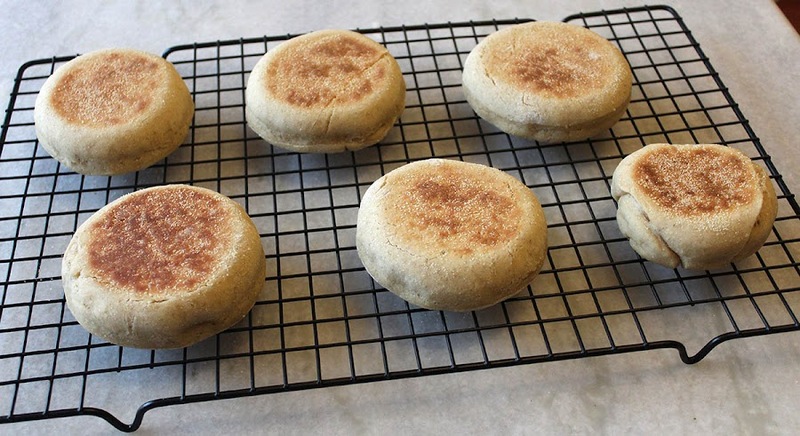 When I was a kid, one of my younger siblings couldn't yet pronounce "English muffins" and would say something that sounded more like "miff muffins." So that's what they are always called in my mind. Ken and I made another batch a few days ago. 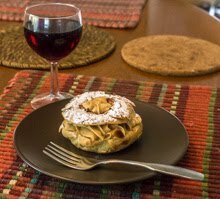 It was an experiment with a different kind of flour and we forgot one ingredient altogether. Miff muffins were common in our house growing up. In addition to toasting them for breakfast, we often made mini pizzas with the muffins serving as the crust. I loved those. They turned out ok, but were a little more chewy that we would have liked. Oh well. They're still edible and we are not deterred. According to Wikipedia, fifty-five is the natural number following fifty-four and preceding fifty-six. It is also the atomic number of caesium, the tenth Fibonacci number, and the sum of the numbers 1 through 10. It is a square pyramidal number, a centered nonagonal number, and a semiprime number. Between 1974 and 1988, it was the maximum highway speed limit in the United States. It is a magnitude 7.9 barred spiral galaxy in the constellation Sculptor. It is the Autoroute de l'énergie in central Québec and an interstate highway between Chicago and New Orleans. It is the direct-dial calling code for the South American nation of Brazil. Fifty-five is also my age for the next three hundred and sixty-five days. Our weekly tv guide magazine. I might make this a regular thing. Tell me if you hate it. I figure that French television is part of the French experience. I'm not a tv snob. I watch a lot. French, American, Canadian, and British stuff. I like that our satellite package lets us choose the language for many programs. I can watch American and British programming in English, and French programming in French (of course). It's Christmas week, and there are lots of cheesy specials on. I won't watch most of them. The satellite package we have is good. But with all that's available, there are still times when I say that there's nothing on. Oh well. That's what DVDs and downloading are for, n'est-ce pas ? 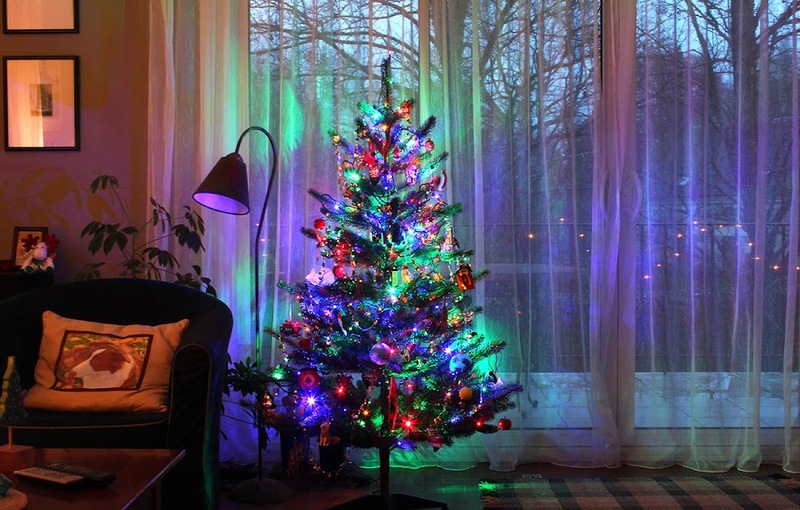 I put up the real fake Swedish holiday tree earlier this week. It's Swedish because I bought it from Ikea. This year, we're keeping it on the floor. In past years, it's been up on a table. I think I like it on the floor better. So, the upcoming week is a biggie for us, food wise. We have steak au poivre on Sunday, then cheese fondue on Wednesday, followed by the big turkey dinner on Thursday. Yum. And then there's New Year's. I haven't done one of these in a while, but I found this picture the other day, so here it is. The year was probably 1985; I was 25 years old. I worked for a member of congress on Capitol Hill in Washington, DC. I didn't do anything related to policy or legislation. 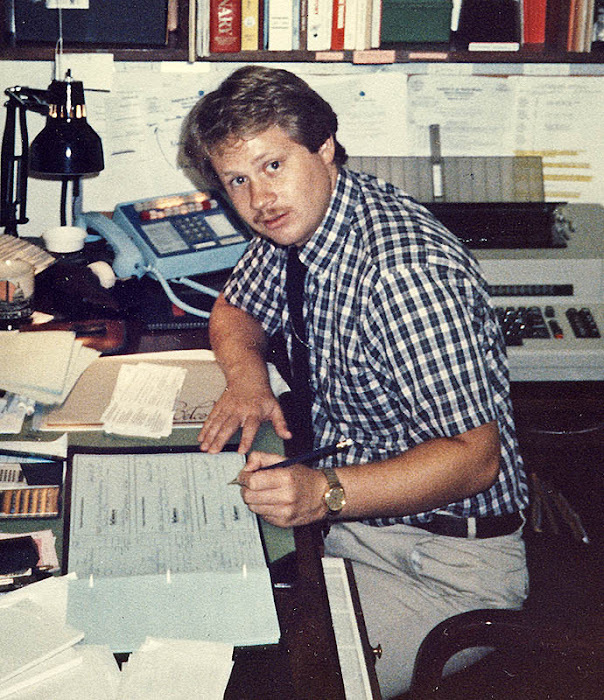 I was the front office staff and did the congressman's daily scheduling, along with other clerical things. And drove him back and forth to the airport. At my desk, writing checks. I had an IBM memory typewriter. It was replaced with a desktop computer soon after this picture was taken. I used WordPerfect back then. I still have that Washington, DC, mug you can see on the desk, upper left. It was a great job and I had a very good time doing it. The congressman I worked for was from southern California and I was lucky to get to go there for my job. I combined the work trip with some vacation time to northern California and visited San Francisco for the first time that year. Ken came with me. I fell in love with that city and decided that I wanted to live there. In 1986, Ken and I left Washington and moved ourselves to San Francisco. I went back to school to complete my education at Berkeley and start my career as a city planner. It's getting close to thirty years ago now. Time flies. Monday morning was a cold one. 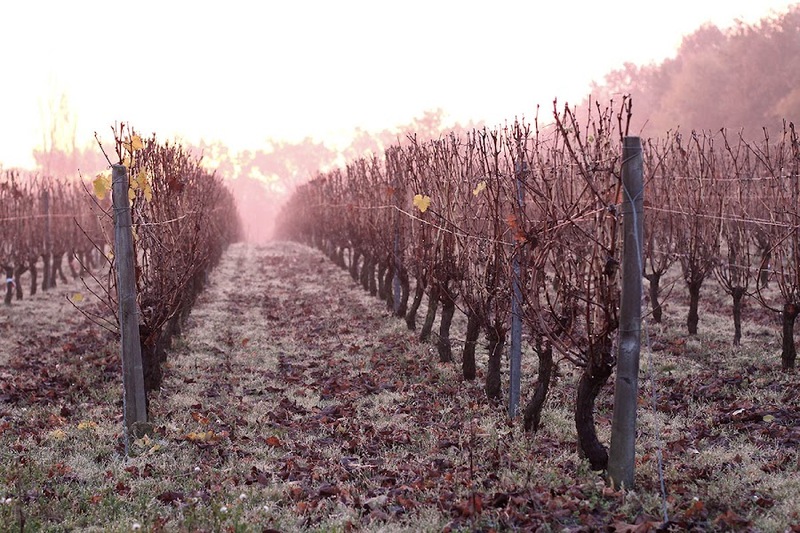 The temperature got down to just below freezing for the first time this season and we woke up to frost. It didn't last long at all, nor did the cold. I wonder, as do the weather people, if we're in store for another unusually warm winter. So far, last year's pattern is repeating: a little cold weather in early December, then no freezes at all for the rest of the winter. 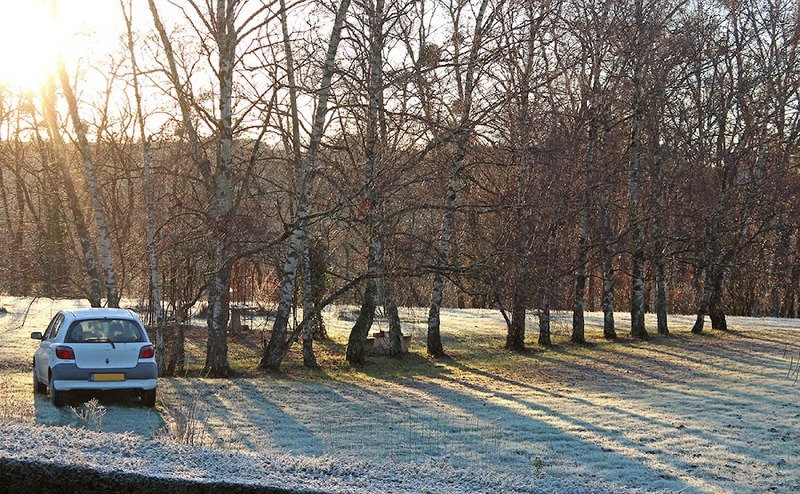 The sun rose over our neighbors' frosty property on Monday. Our weather is tempered by the effects of the gulf stream, which brings relatively warm and wet weather systems sweeping across the British Isles and northern France. In winter we can get cold arctic air flowing down from Scandinavia and northwestern Russia resulting in freezes and occasional snow. But that didn't happen last winter, which went down as one of the warmest in memory. 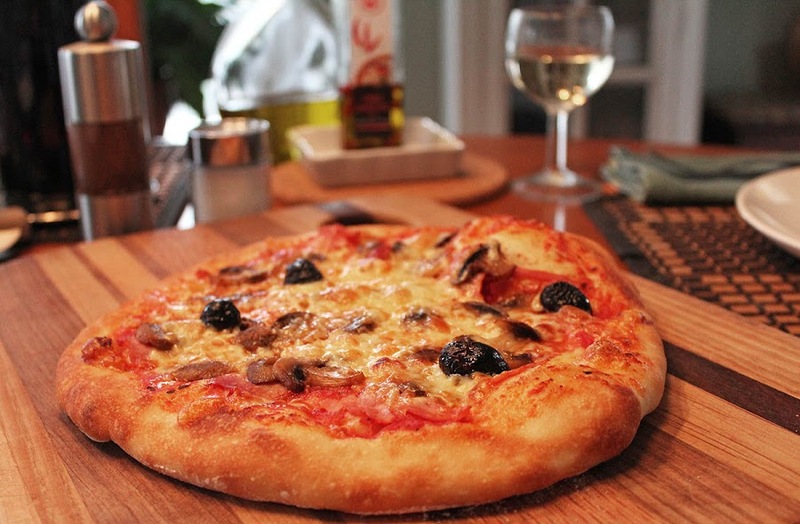 Not much to say other than we thoroughly enjoyed our pizzas for lunch yesterday. I made the crust on Sunday and let it sit to rise for eighteen to twenty hours. We used our own sauce (made from this past summer's tomatoes), and added ham, mushrooms, and Cantal cheese. Food pictures are not easy in dim light with a hand-held camera. But I was too eager to eat to get out the tripod. When we have pizza lunch, I make two pies. I bake one, then, while it's baking, I roll out the second crust to rise. After the first pizza is devoured, I make and bake the second one. I've got it down to a routine, if not a science. We followed the pizza with a green salad topped with Ken's home-made ranch dressing. The newly re-planted vineyard parcel out back is coming along. The guys are in the process of putting in the stakes that will support the guide wires along each row of vines. The stakes are made of steel, a modern version of the the traditional wooden ones that don't last nearly as long. Robust wooden stakes are still used, however, at the ends of each row to anchor the guide wires. The end stakes are in, waiting for the wires that will eventually support new growth in each row of vines. Most of the steel stakes are in, but not all. I expect they'll be installed in the coming months along with the wires that will support new growth next spring. Except for a few strays here and there, the vines have lost all their leaves. The vineyard is now a sea of brown. I've noticed that pruning is under way in certain parcels. The vines are pruned by hand, one by one, a long job that will likely last into March. 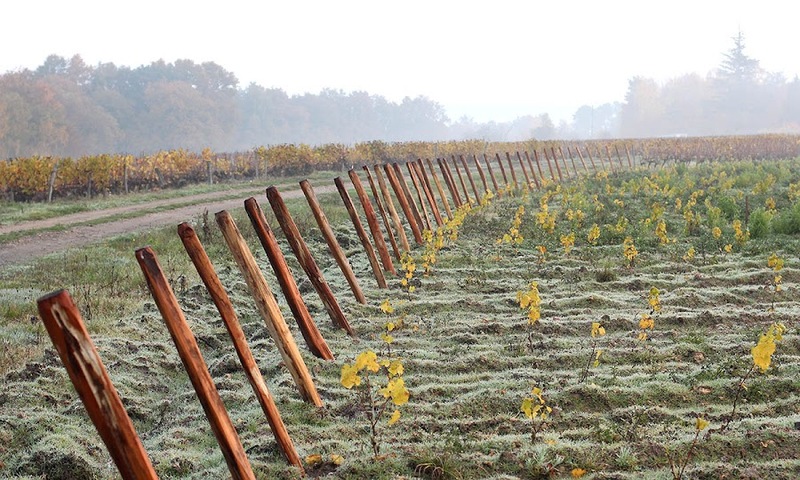 Bare vines on a foggy morning. Ken and I went to the market on Saturday to order our Christmas bird. This year it's a turkey and we'll pick it up next Saturday. It will weigh between three and four kilos (six and a half to eight pounds). That's plenty big for two with generous leftovers. 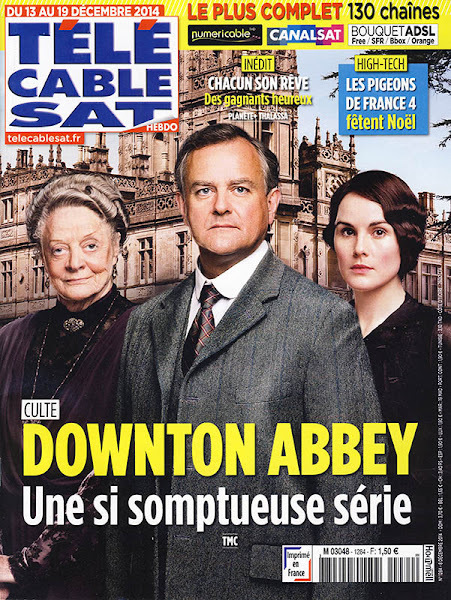 Here is the cover of the upcoming week's television guide magazine. When we first moved here, I would go into town every week to buy the tv guide. Sometimes the newsstand would be out of them, usually because I would just forget until it was too late. At some point it dawned on me that I should just subscribe and have the magazine delivered to the house every week. Duh. Downton Abbey, a very sumptuous series. With a cult following. That was probably about eight or nine years ago. Now all I have to remember to do is to renew my subscription once a year. As this week's cover announces, one of our channels (Télé Monte Carlo) will be showing the final episode of season three of Downton Abbey, along with a two-part Christmas special. Then, in the following week, they will start showing season four. I think we're about a year behind the US and the UK. And, in case you're wondering why pigeons are celebrating Christmas, the pigeons in question are a team of consumer reporters who have a show on France 4 called "On n'est plus des pigeons (We're not suckers any more)." 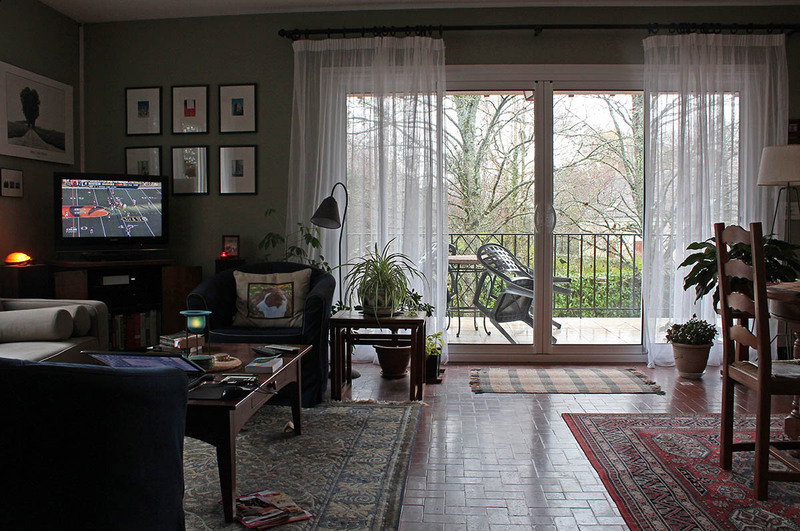 As winter approaches, we are, naturally, spending more and more time inside. There is still work to be done outdoors, but it's been too wet to rake leaves. I go out every day now to split logs and bring in the daily firewood. All the potted plants that need to come in for the season are in, and this weekend I will bring in the deck furniture. Watching Cincinnati lose to Pittsburgh on Sunday Night (American) Football while it storms outside. I record the games overnight and watch them the next day. I will also give the bbq grill a good wipe-down over the weekend. It's sheltered on the deck, so it will stay outside. We just ordered a new grill cover to help protect it. The days are short, but when the sun comes out it's nice. Gloomy overcast days are for cooking and watching football on tv. Wednesday's weather, that is. A fine rain fell most of the day, driven horizontal by wind. 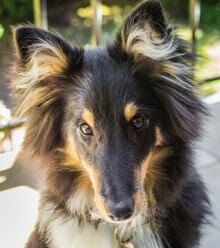 Callie and I had to cut our morning walk short because it was just too wet and miserable for either of us to enjoy being out in it. The air was cold, but not freezing. It was just an all around yucky day. The view from the bedroom window. What looks like fog is actually rain. Of course, it could have been worse. Freezing temperatures would have meant ice and snow. We're expecting more rainy weather over the weekend, but today is predicted to be a little nicer. On the positive side, our car passed its biennial inspection, so we're good for another two years. This is a small section of the potager (kitchen garden) at Villandry. The pumpkins were either grown elsewhere, or the plants have been pulled up. Either way, the fruit has been artfully arranged on raked beds. Very zen. Notice the beautiful artichoke plants (or are they cardoons?) in the upper left. I've grown pumpkins like these, but not as many. This is the last of the photos from our one day visit to Azay-le-Rideau and Villandry back in October. Thanks go to my friend Christine for a great day! One last shot of the water garden at Villandry. As I said before, there are six distinct gardens on the castle grounds, but when I visited with my friend C. back in October, we did not see them all. Somehow we completely missed le jardin du soleil (the sun garden), which is right next to the water garden. Instead, we walked down the allée and around le labyrinthe (the maze). Grass and shrubs and trees. There were some kids navigating the maze, but it didn't look like much of a challenge because most of the leaves had fallen off the hornbeam hedges and we could see right through, so we just walked around the outside. 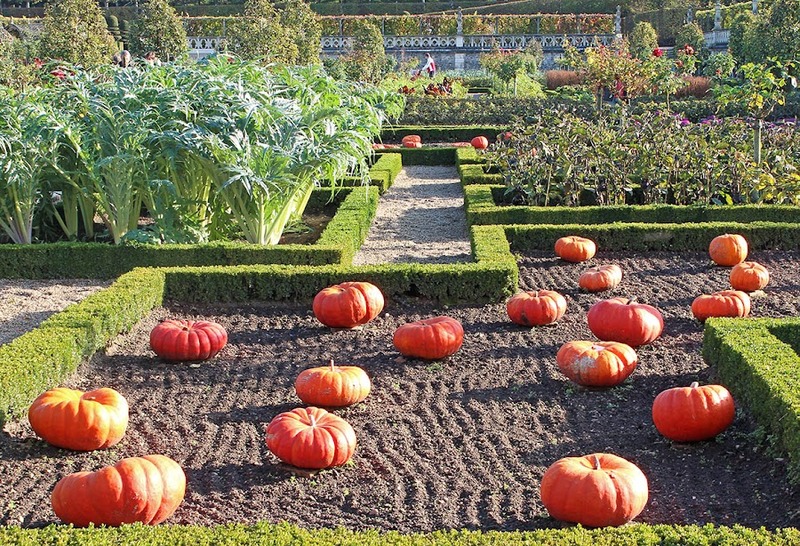 This is the simplest garden at Villandry, I think. Just grass, paths, and shrubbery planted in pots. Of course, there are slopes and steps and the whole thing is surrounded by rows of tilleuls (linden trees). But compared to the other more elaborate garden spaces all around, this one is serene. The brochure says, "C'est l'endroit idéal pur se reposer et méditer (It's the ideal spot to rest and meditate)." A very simple, yet elegant, garden. The castle's donjon (keep) is visible just behind. In many formal French gardens, potted plants, shrubs (like these), and trees are taken indoors for the coldest part of winter. The bigger châteaux (like the Louvre or Versailles) had special buildings for over-wintering citrus trees and other warm-climate plants like palms. The buildings are called orangeries and many are still used to shelter plants during the cold weather. One famous orangerie, in the Tuileries gardens outside the Louvre in Paris, was transformed into an art museum in the early twentieth century. If Villandry has an orangerie, I did not see it. 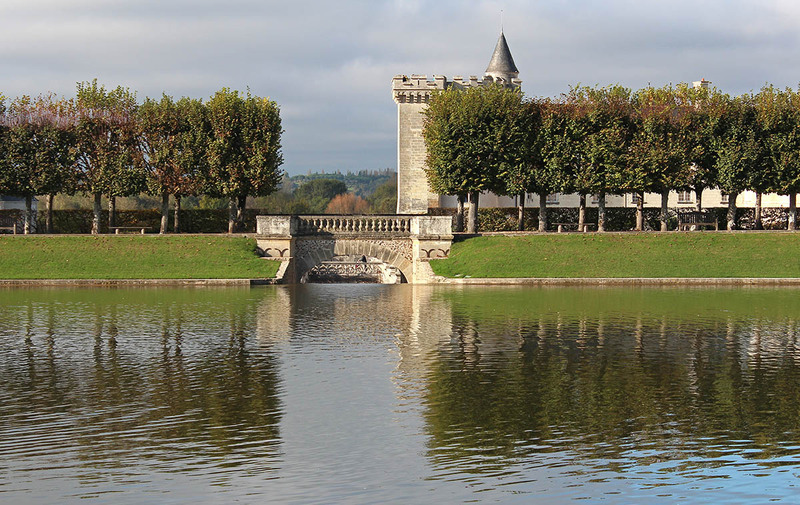 The main feature of the jardin d'eau at Villandry is a large reflecting pool. 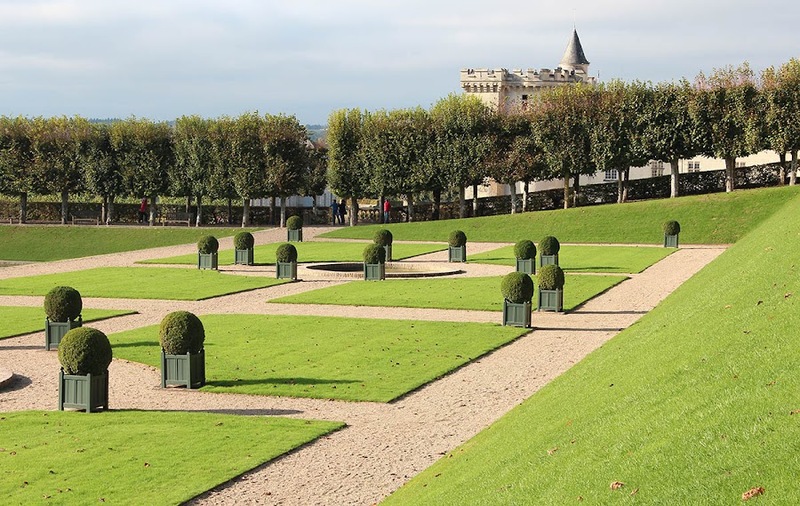 It's surrounded by grassy parterres and potted shrubs. The water spills into a small canal that runs down toward the château and into the moat. From what I've read, the water is used in the gardens. Looking north across the basin in the jardin d'eau. I didn't get a shot of the swans this time. A pair of swans hangs out in the basin. I remember seeing swans there in 2001 and wonder if it could possibly be the same pair? I've read that swans are partial migratory birds, but that many of them inhabit the same nesting ground for years, and that they can live a long time. Maybe not that long. 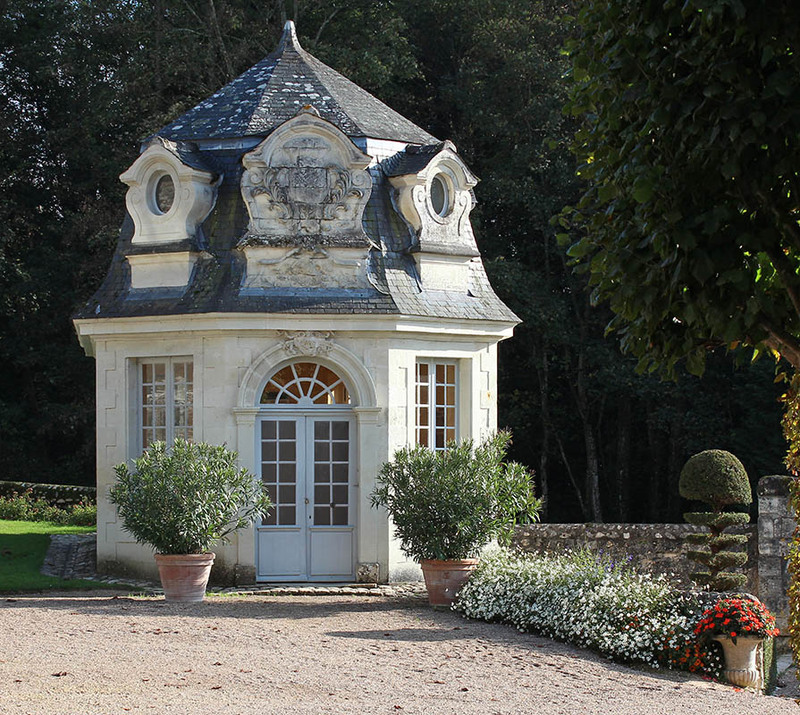 This little jewel of a building is located on the edge of the gardens at Villandry. The only mention of it in the pamphlets I got at the château is a sentence referring to it as le Pavillon de l'Audience, built in the eighteenth century. It sits almost behind the scenes, near to where the greenhouses are. Le pavillon de l'Audience, Villandry. A little quick internet research reveals that it was built by the then-proprietor of the castle, the Marquis de Castellane. He used the building as a place to receive (give audience to) the farmers and other people who worked the lands around the castle and town. I guess allowing the peasantry into the château itself was out of the question. According to what I read, the building was completely renovated in 2004. 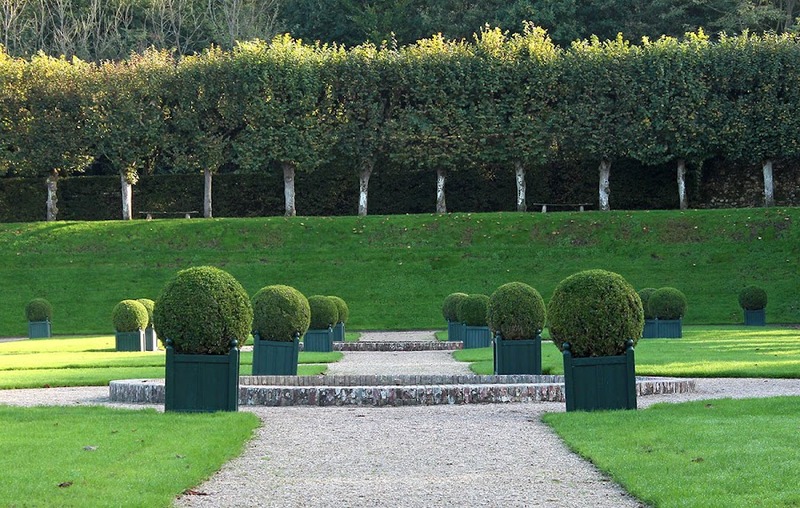 Formal French gardens will typically include allées (avenues), straight and narrow pathways bordered on each side by trees. The most famous parks in the city of Paris, like the Luxembourg Gardens and the Tuileries, are filled with them. 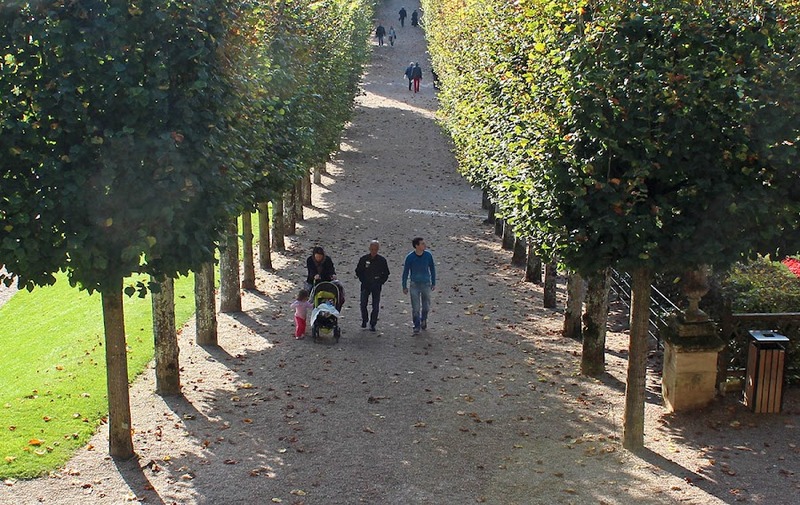 Even here in Saint-Aignan, the path along the quai in the center of town is planted with rows of tilleuls (linden or lime trees), or maybe it's platanes (plane trees), forming a nice allée along the riverfront. In late October, this allée is perfectly shaded from the low sun. Until the leaves fall, that is. This is one of many allées planted in the gardens at Villandry. If I remember correctly, it's probably the longest one, running nearly the full width of the garden from the forest on the east to the labyrinth on the west. 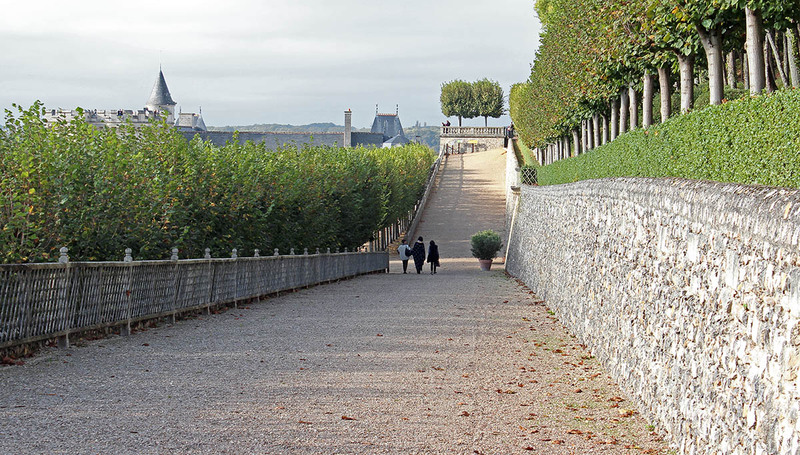 There are stairs in the Villandry gardens for getting from one level to another, but there are also long ramps here and there. They make strolling easier because you don't have to pay attention to steps. These ramps come down from the terraces next to the forest and lead visitors toward the ornamental garden that you saw in the previous posts. The crenelations on the castle tower are just visible in the upper left. Our days are gloomy right now. Dark due to overcast skies, misty rain, drippy trees, and cold. But it won't be long until the solstice when the days will stop getting shorter. Once visitors exit the château at Villandry, they find themselves on the terraces between the forested hill to the east and the gardens to the west. There are nice views of the gardens to be had from above in anticipation of actually walking down into them. We visited in the afternoon, so I was taking pictures from above into the sunlight. At least there was sunlight. The ornamental garden (or garden of love) is in the foreground of this image with the kitchen garden behind. The green garden to the left, on a level just above the kitchen garden, is intended to represent music with stylized instruments and musical notes depicted. It's just as difficult to make them out in person as it is in this photo. At least, for me. 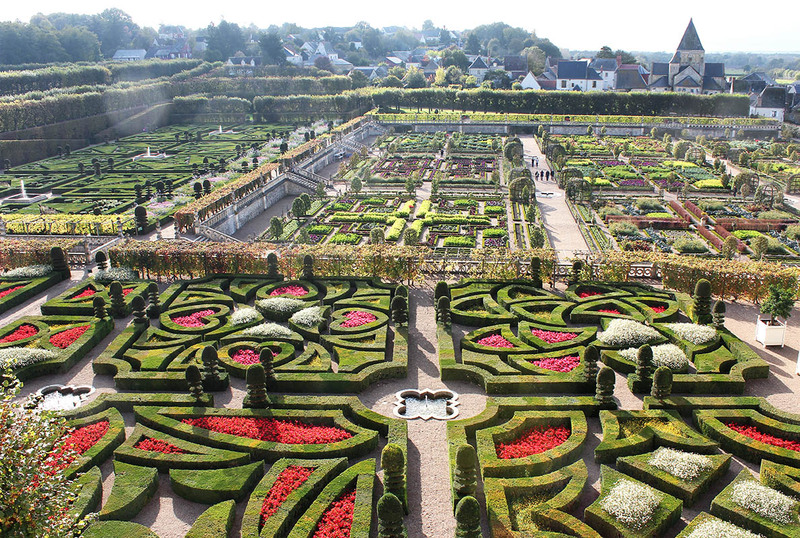 This garden is one of Villandry's prettiest. It's the ornamental garden just outside the castle's southern façade, separated from the kitchen garden by a small canal. The garden's theme is "love" which is represented by four parterres representing l'amour tendre (tender love), l'amour passionné (passionate love), l'amour volage (fickle love), and l'amour tragique (tragic love). 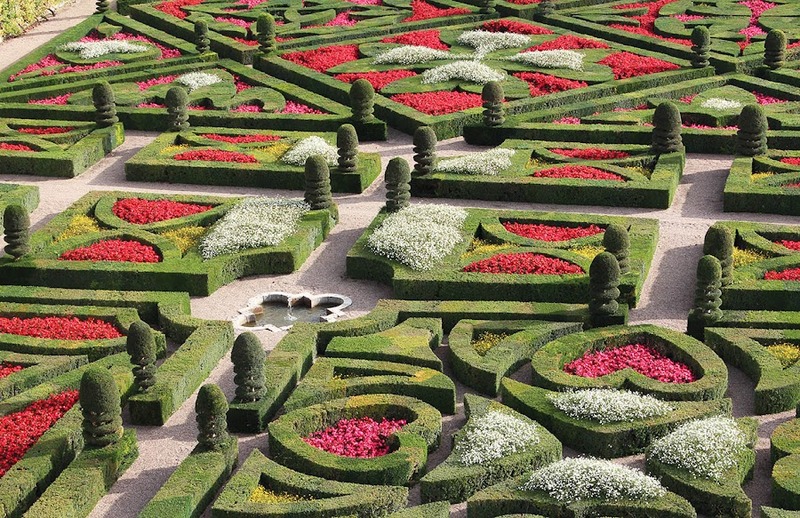 Another adjacent parterre includes representations of the crosses of Malte, Languedoc, and the Basque country. The heart shapes are in the "tender love" garden. The Maltese cross is at the top of the photo. We saw the ornamental garden from two vantage points. The first was from high up on the castle tower (above), the second from one of the terraces below the forest. I'll share a couple of different perspectives in the next posts. The main attraction at Villandry is the garden. Or, I should say, gardens. There are six distinct gardens laid out geometrically on the castle grounds. 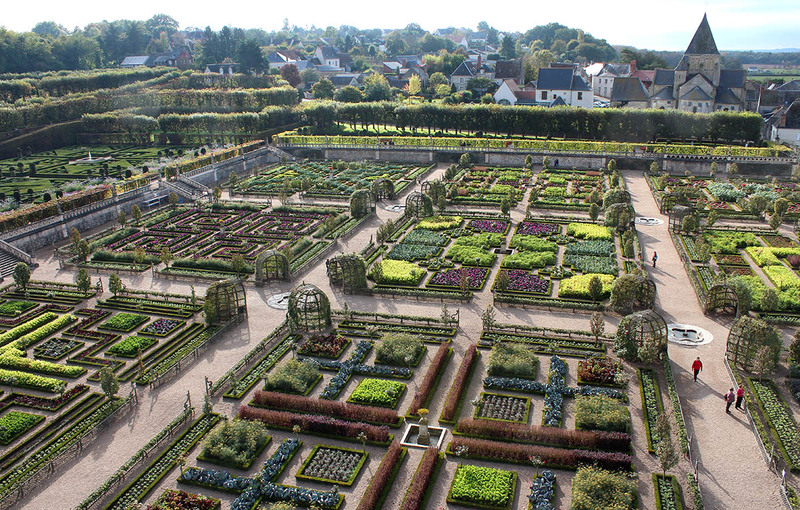 The largest, part of which is pictured here, is the potager (kitchen garden). My photos do not do it justice. It's impossible to take the whole thing in at once, although I imagine you could do that while floating above in a hot-air balloon. Part of the kitchen garden and medicinal herb garden as seen from the castle tower. Visitors stroll along the many paths and corridors through each of the gardens, seeing everything at pretty much eye-level. The exceptions are the castle tower and the terraces along the edge of the forest where you can get some elevation. I'm hopeful that my snapshots will give you a feel for the place, but there's no substitute for actually visiting.